If your budget is small but your enthusiasm for upgrading is high, then the Performance Hybrid Bike/Flat Bar Road Bike will be a great project for you. If you’re looking for a cheap entry level bike to upgrade as your funds see fit, then this Performance Hybrid bike is a great starting point for your cycling adventure. For such a low-priced bike, the features on this hybrid are surprising. The quality of various components matches that of more expensive versions. In addition to the great price, this bike offers great capacity to handle the demands of both commuting and light off-road cycling. However, an inadequate set of instructions, and some low quality components requiring upgrades make the bike a less appealing choice for some people. If you like to tinker then this bike is for you! 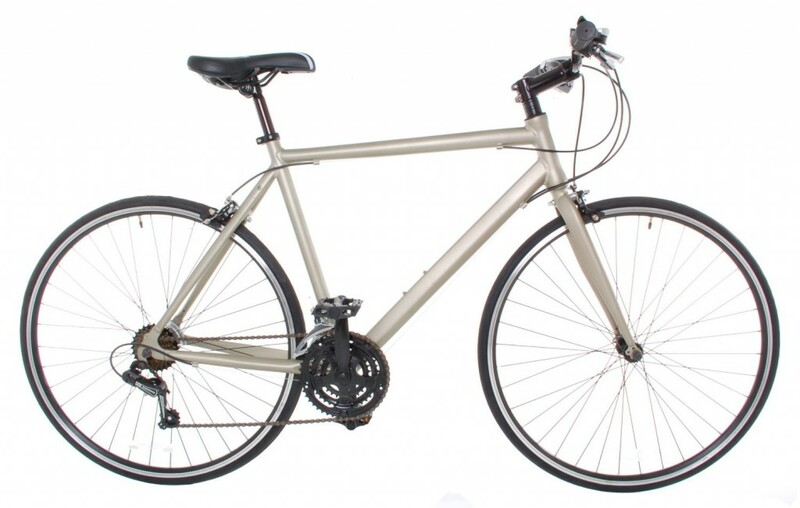 This bike features a fast and ergonomic design for shoppers working with a limited budget. The overall construction quality of this bike is quite sturdy and will do just fine when cycling in various terrains. Also, with 21 gears to choose from, the cycling experience should be quite effective and efficient. All these features make this bike good for recreational riders as well as commuters. The frame is lightweight and sturdy, which makes the bike lighter and easier to handle in various terrains. The tires are large and relatively thin, which makes them more suited to road and pathway riding. Its the thinner tires that will make your roll faster on the road. The broad choice in gears means that you can handle nearly every terrain imaginable without much problems. Various customers attest that the Performance Hybrid Bike/Flat Bar Road Bike is well worth its price, and offers great value for money for people working within a limited budget. Overall, the bike is light, offers a smooth ride and comes with various sizes to accommodate a broad range of riders with regard to height. Finally, the assembling process is not great as a short chain makes truing the rear derailleur impossible without a new larger chain. Most seek expert help to assemble and fine-tune the bike. Upgrades might be necessary to make this bike’s use experience worthwhile, since some of the components are of noticeably low quality. A: The Performance brand uses caliper brakes (used on road bikes), while the Vilano Hybrid uses the much better linear pull brakes (used on hybrids and mountain bikes). This Performance bike won’t allow for a linear brake upgrade. But you can get the expensive dual-pivot caliper brakes that can match the performance of linear pull brakes. A: I looked at the pictures of the Vilano bike and I can see where the difference in price is. It looks like you would pay more, and you will get more. I own the “Hybrid Performance Bike”, and it is doing what I was wanting it to do. A: This bike mostly has the same cheap components as the one I bought. The frame is similar but slightly different. It looks like this bike has better trigger shifters and a better rear derailleur. If so, it may be worth the difference in price. A: The only difference that I can see is this frame has a name on it. And the frame on the bike I have has no frame. I believe it was made for Shimano by the same people. All the equipment seems to be the same. A: Not much bigger than the bike itself. Measure the frame plus one tire already mounted, that was the size of the box length wise. Height wise would be from top of handlebars to ground. Question: What is the recommended size for someone 5′ 10″? A: I am also 5’10 and tbe 21 is maxed out as far as size goes. I have no problem riding but any larger and I would. Your cycling experience with this bike could be significantly improved if you upgrade the tires, brake pads and chain. For new tires try the Continental Gatorskin Wire Bead Road Bike Tire, as the reviews are outstanding. Additionally, those who may have to carry some load with this bike could have a rear rack for the added functionality. This should be quite easy, considering the bike comes with mounting points for a rear rack right out of the box. Finally, you should also get some wrenches and screwdrivers to assemble the parts and make adjustments on components. The Topeak 2011 Update Survival Gear Box will do the trick. This bike is just as advertised: the frame is of high quality, and the bike is generally comfortable, light, and offers a smooth ride. Additionally, it comes ready to add extras such as a water bottle holder and rear rack, which are important accessories for many riders. If your budget is small but your enthusiasm for upgrading is high, then the Performance Hybrid Bike/Flat Bar Road Bike will be a great project for you. If you feel its too much for you to continually upgrade the bike then we’d suggest getting a higher quality model.